Casey has been such a good girl. She really prefers to stay home and cuddle all day, but she has been going out for over a week now. We are using the stroller attachment for her feeder seat now and it seems to help when we have her out. She is MUCH more comfortable. We made at least one, ofter more trips to the hospital each day while Tim was there and often would be there all day. Casey did great. She didn’t have any big fits, she took her naps, she was just a perfect little angel. She has been having a hard time sharing attention with Daddy. She is used to getting all of my attention as well as Tim’s and now that he is getting a lot she doesn’t seem crazy about it, but she is adjusting. Over the weekend Casey and I went to a Cranial session/training where she was able to get multiple hours of therapy. 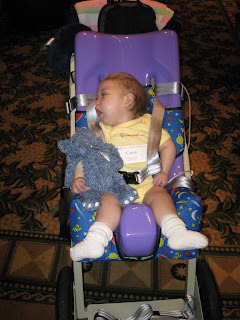 Her usual therapists gave her an outfit to wear (in the picture) with a Bee Well Kidz logo. Tim said Casey is like a sponsored athlete, but I just say she’s cute. She had three people working on her and they all said that she responded very well. She slept the entire way there which made the drive to Redondo pretty easy. During the lunch break Casey’s therapists treated us to Cheesecake Factory and she did great there too. I put her on the seat next to me so I could hear her and she went to sleep. Then after the afternoon session was over we headed home. Since she was being so good we were able to stop on the way home at Target. Everyone that saw her had to come up and say how cute she is. She whined a little on the way home, but not bad. We had stopped at Target to try and find a new front facing car seat. She is getting so big and is hanging out of her rear facing seat. I am hoping a new seat will make the car a little easier for her as well. We didn’t find one at Target that I liked so we ordered one online after we got home. It should be here in the next few days. Now that we know she is a girl we were able to find one with her signature color this time. The princess needs her pink.